Running your hockey pool has never been easier! If you love professional hockey, nothing is more exciting than the pursuit of the Stanley Cup. 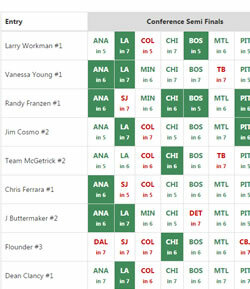 A great way to enjoy the NHL Playoffs is by running your own Playoff Bracket pool this year. Even better, run it online with our industry-leading pool management services. The time for playoff beards and handshake lines is almost here! The winning team is the team with the most points at the end of Playoffs. The price to continue using the service is based on the number of bracket entries in your pool. The following price tier structure is your one-time fee for the entire Stanley Cup Playoffs! 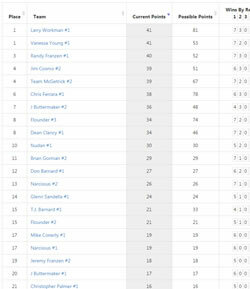 NOTE: An "entry" is considered a member's submission of one complete bracket "sheet", containing all 16 playoff teams. 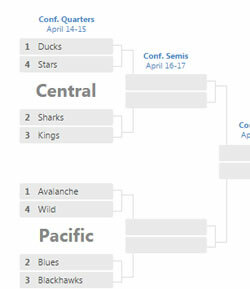 Stanley Cup playoff pools can be an excellent promotional opportunity for your business, raise money for a charity, or fund-raise for a youth sports team. It's ABSOLUTELY FREE to add your company or organization logo to customize the look of your hockey pool. For more information, see our Brand Your Pool page. 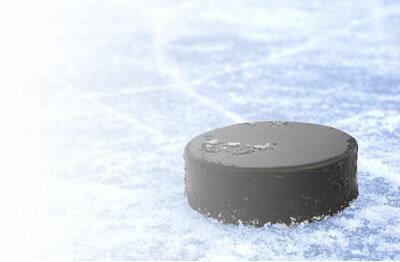 Start your NHL Bracket pool with us today. If you have any additional questions, please contact us via e-mail. We're happy to answer any questions you may have.